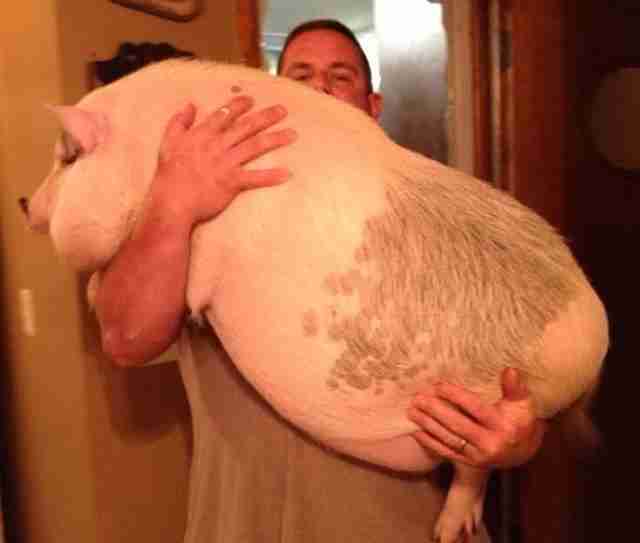 There has long been a disturbing trend in the pet world to try and make animals smaller. People covet tiny "designer" pets that they can tote around in their designer purse. The draw of having a little bitty, portable pet that can be dressed up in tutus seems irresistible to many. 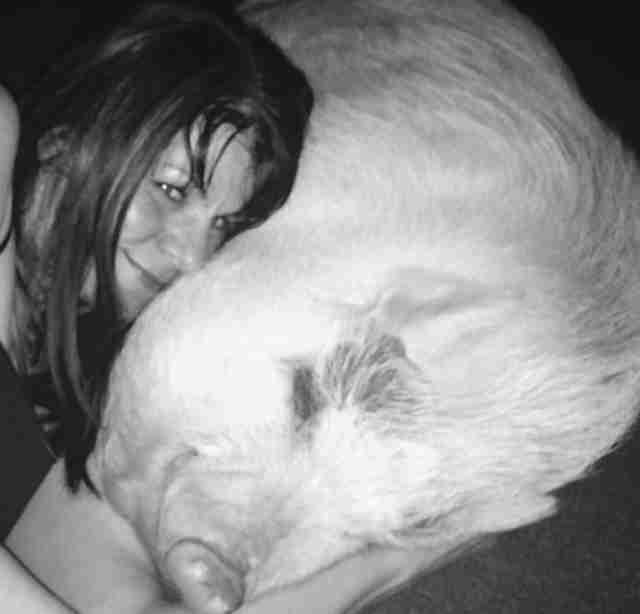 Breeders of pet pigs are also busily trying to produce ever smaller pigs, often resulting in life-long health problems and a much decreased life span. People are rushing out and paying big bucks to have a tiny pet. The end result for chihuahuas is not good, as shelters are overflowing with them. Pigs are facing much the same fate. 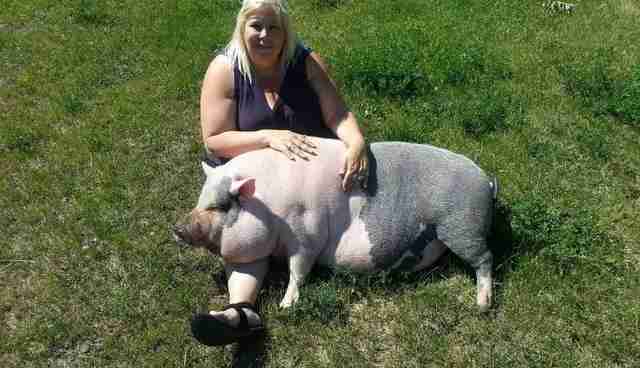 On a happier note, there are lots of pig parents out there who revel in the beauty of their plus-sized pet. 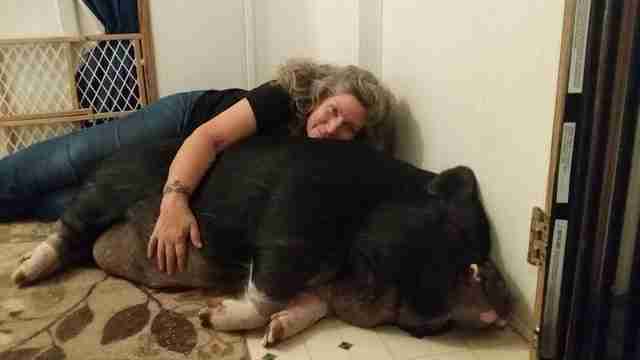 Some rescued their pig as a fully grown adult, and therefore have no delusions as to how big their pet is going to get. Others fell for the hype and purchased a dimunitive oinking bundle, only to watch them grow...and grow..and grow, but are dedicated to loving and providing for them no matter how big they get. 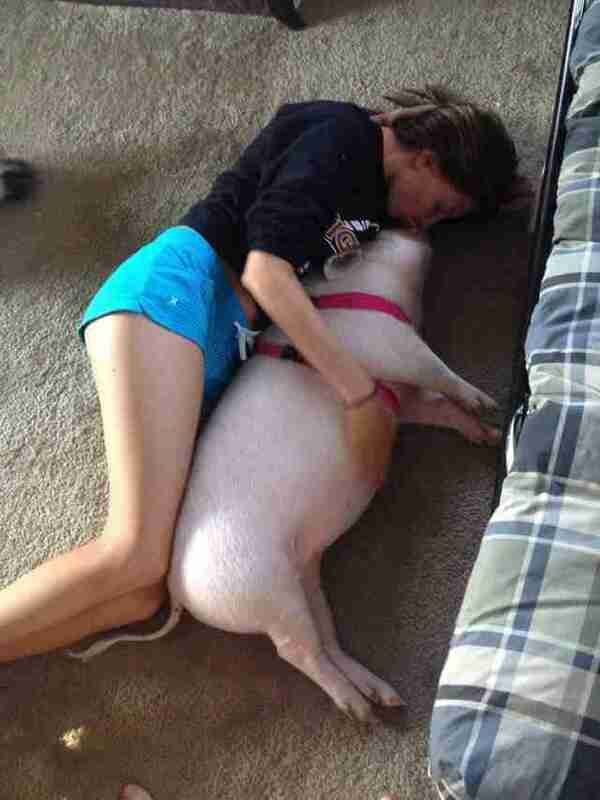 One internet famous example of this in action is Esther The Wonder Pig. 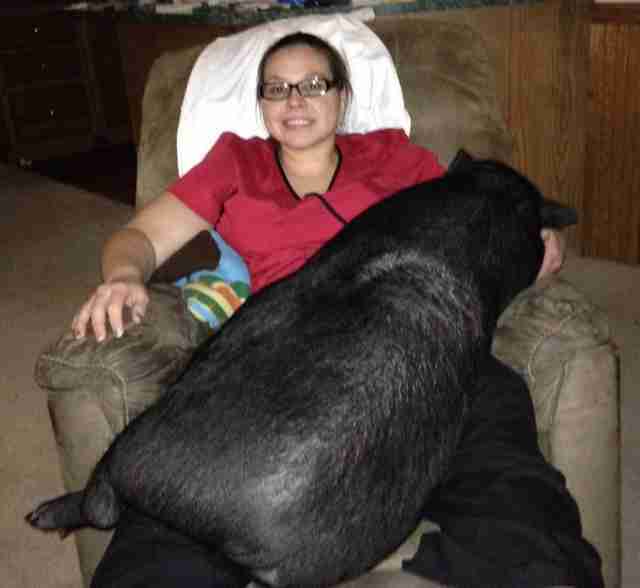 Her dads Steve and Derek thought they were adopting a "teacup" pig, and ended up with a full-sized commercial farm pig instead. 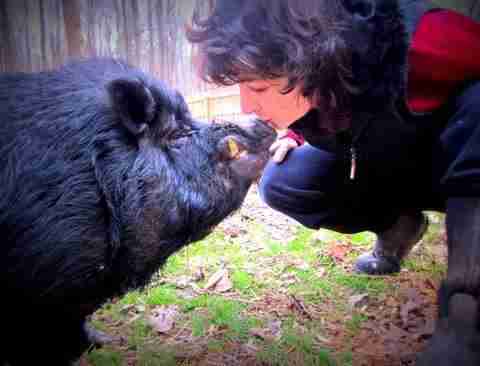 Not only did they keep her, they dedicated their lives to her, and Esther now happily resides at Happily Ever Esther Farm Sanctuary, a safe haven started by her dads, to keep her and other rescued farm animals for their lifetimes. People who take on a pet with the dedication to follow through for that animal's lifetime are sadly the exception and not the rule. Just take a walk through any animal shelter or ask any rescuer, and the reasons people give for bailing on their pet will alarm you. 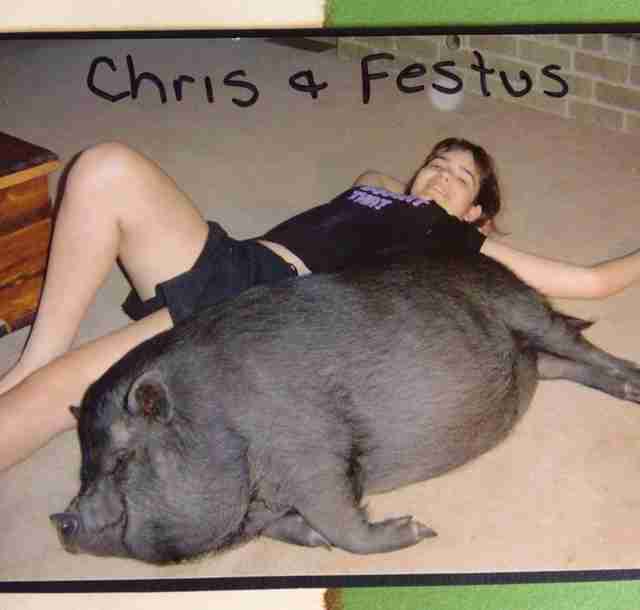 "He barks/oinks/meows too much. He dug up my flower garden. He's too old. He's too puppy/piglet/kitten like. He eats too much. We moved/had a baby/got a new pet. 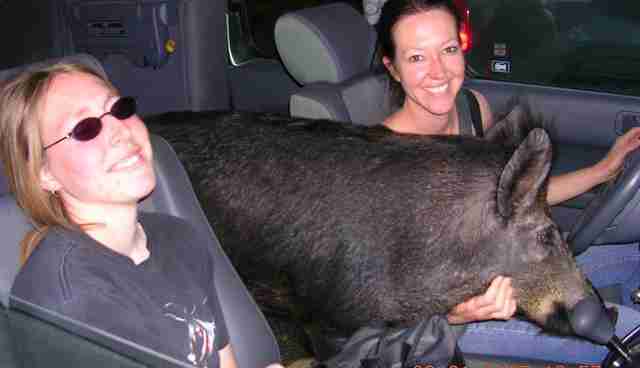 And most often in the case of pigs- HE GOT TOO BIG." 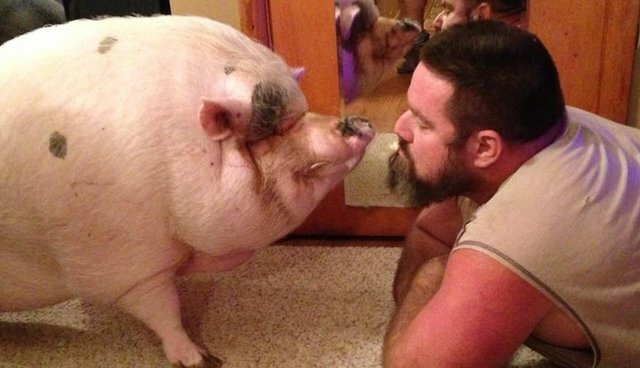 Here is a selection of heartwarming photos of people who love their pig, even when he got too big. Meet Dillon. Photo: Facebook, Jeri Janel Johns Dillon's parents knew that he wasn't going to stay small, but they were still a little surprised when Dillon hit the two hundred pound mark. No matter, they love him unconditionally. Jeri says, "He is loving and gentle with anyone who accepts him. And he is grumpy and a force to be reckoned with when he encounters people who don't. I wouldn't trade him for the world. He fills me with joy every day!" 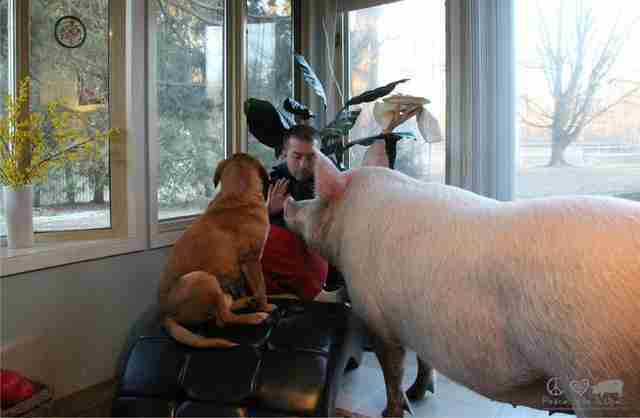 Certainly a two hundred pound animal requires a savvy parent, but there are many who step up to the plate, thankfully. 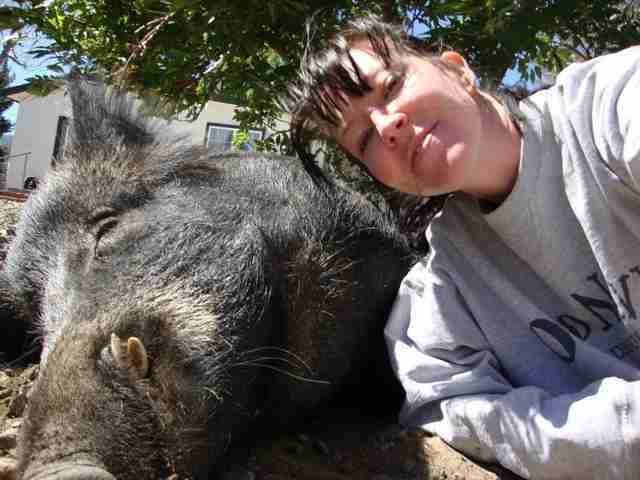 Check out Regina and her cuddly boy Ivan, who tips the scales at about four hundred and fifty pounds. 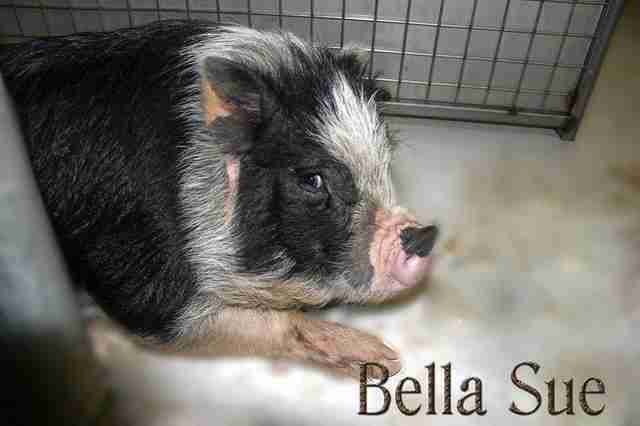 Photo: Facebook Regina Louise Below is Stella, already a big, bodacious girl at one year old. Photo: Facebook Jess Householder Here is Festus, Tracy McDaniels big boy. 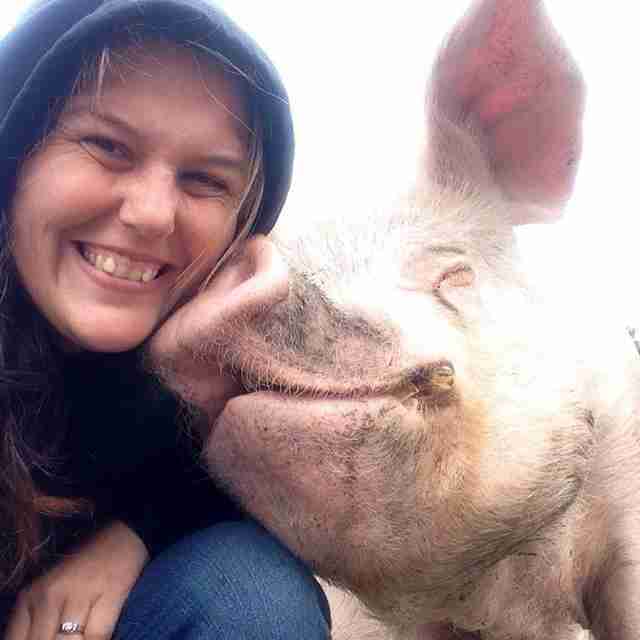 Tracy operates Hamalot Pot Bellied Pig Rescue in Sand Springs Oklahoma, and Festus is her personal pig. 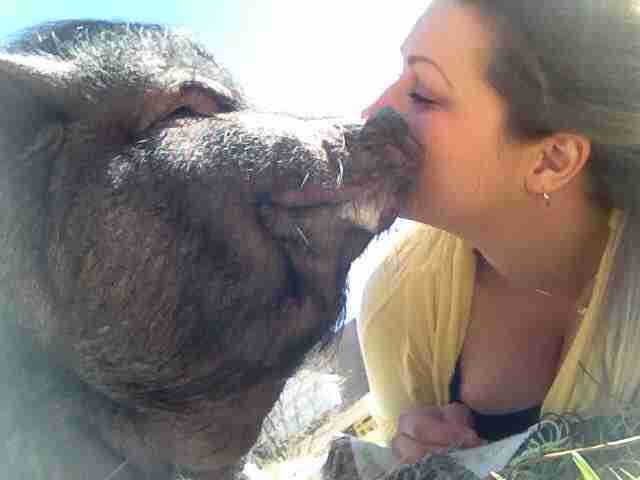 Photo: Tanya Marshall-Jarvis Here is Logan, of Kindred Spirits Sanctuary with the very kissable Gomer. 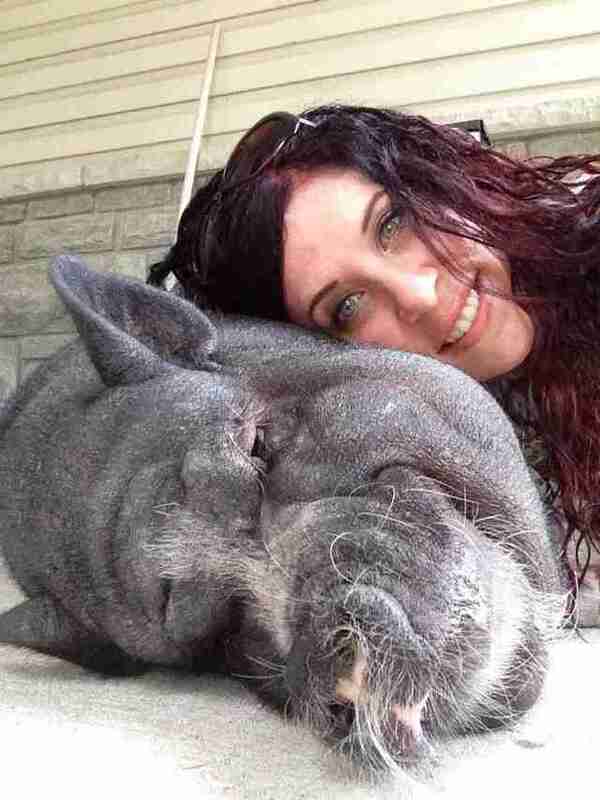 Photo: Facebook Regina Louise Vicki Phillips Vargo and her husband Paul love their stocky Rocky. Good thing Paul's a power lifter! 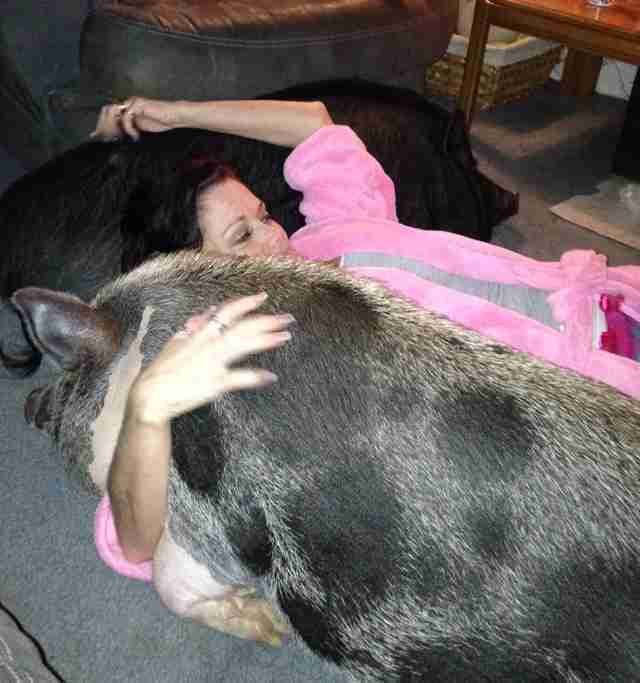 Photo: Facebook Kimberly Shaffer Tracy Snyder will still dole out the cuddles to Diego and Lily, just all the more to cuddle! Photo: Facebook Susan Robertson And just because he's utterly beautiful, Roberta Schiffer and P.Chan again. 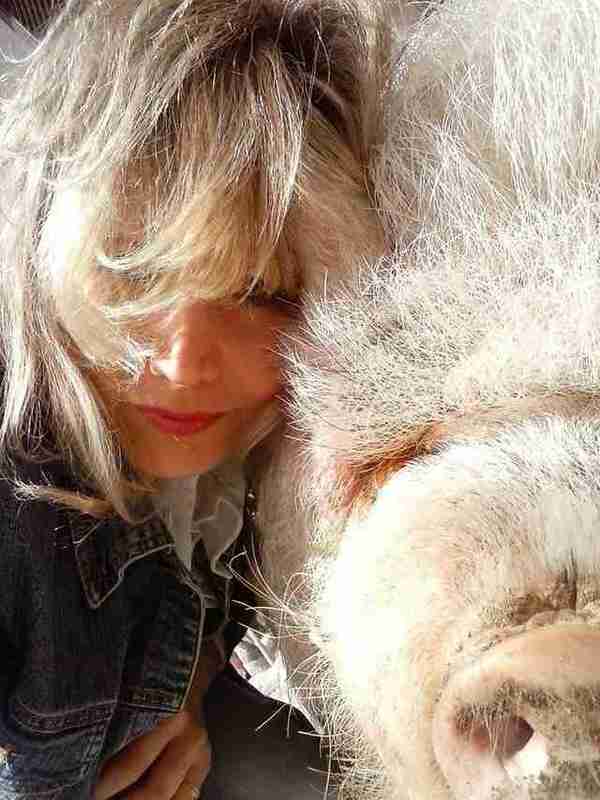 Photo: Facebook Roberta Schiffer So you see, ultimately, size does NOT matter when it comes to loving our porcine friends. 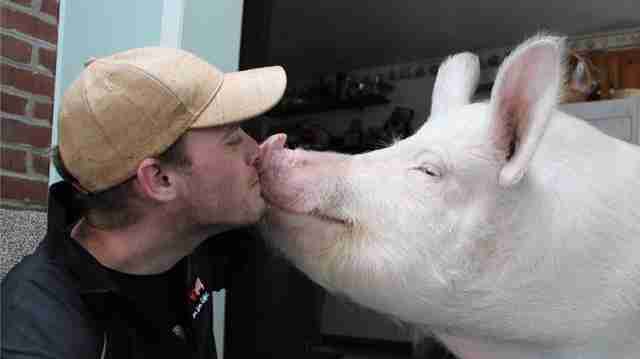 It's kind of like a marriage, for richer or for poorer, wee piggily wiggily or hogzilla, they all need our love. 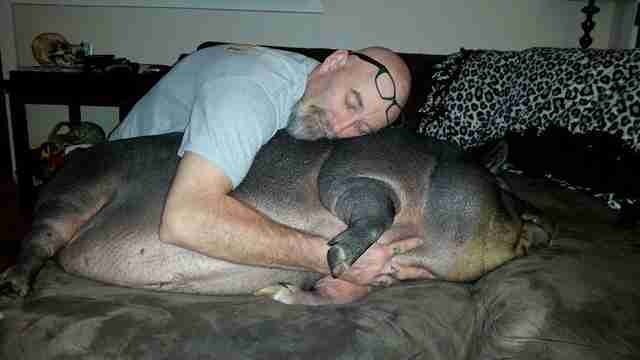 Hats off to those who honor their commitment to their pets, regardless of size or species.